No motors, no crowds, no noise, a whale experience you won’t forget! 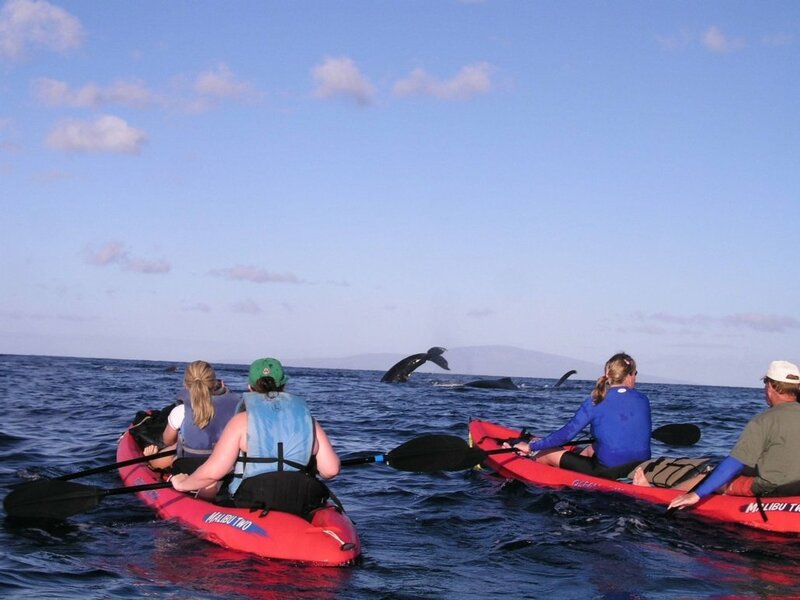 There is nothing like a private Maui whale watching tour on a kayak, canoe or stand up paddle board. 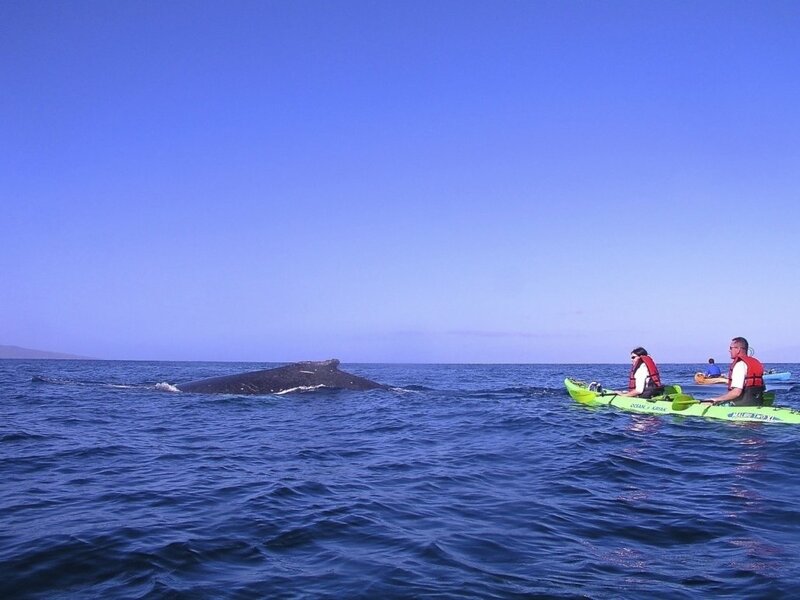 Escape from the crowds and have a personal experience with humpback whales. A stable and beginner friendly choice, kayaking is something ANYONE can do. 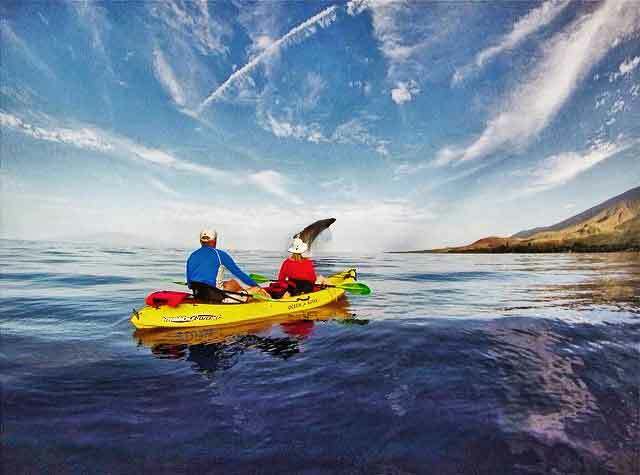 We use ‘Ocean Kayak’ Malibu Two’s, Scuppers and Scramblers. These almost impossible to flip vessels provide a safe and secure option great for family, a couple or individual fun. 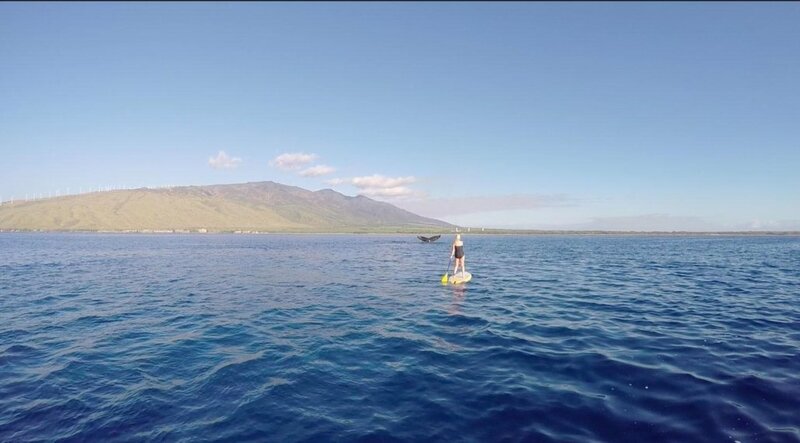 The nice thing about being on a PRIVATE whale watching tour in Maui is if you want to break up your trip and snorkel for part of the tour you can. You get to call the shots. John is an extraordinary guide and an amazing person that taught us about the ocean, local culture, life and respect for all. 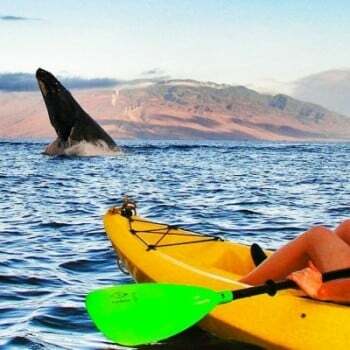 Our kayak whale watching experience with Hawaiian Paddle Sports was incredible & something that most people only watch on Discovery Channel. HPS lives it! Wow, what a FANTASTIC experience we had with this tour. If you have the opportunity to do this one in a life time kinda experience, you should. 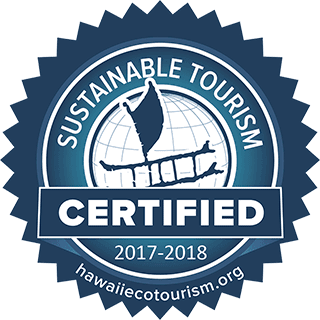 Respect and thanks to you, Hawaiian Paddle Sports!!! T he modern Hawaiian Outrigger Canoe or Wa`a is where ancient Hawaiian Culture and modern technology mix. In ancient days wooden Wa`a were used for transportation, fishing, voyaging, and sport for chiefs or Ali`i. Today’s modern fiberglass design allows for a more stable, performance-based canoe perfect for individuals, small groups, families, and children. The Ama or outrigger provides stability allowing for a narrow hull which cuts through the water with ease. 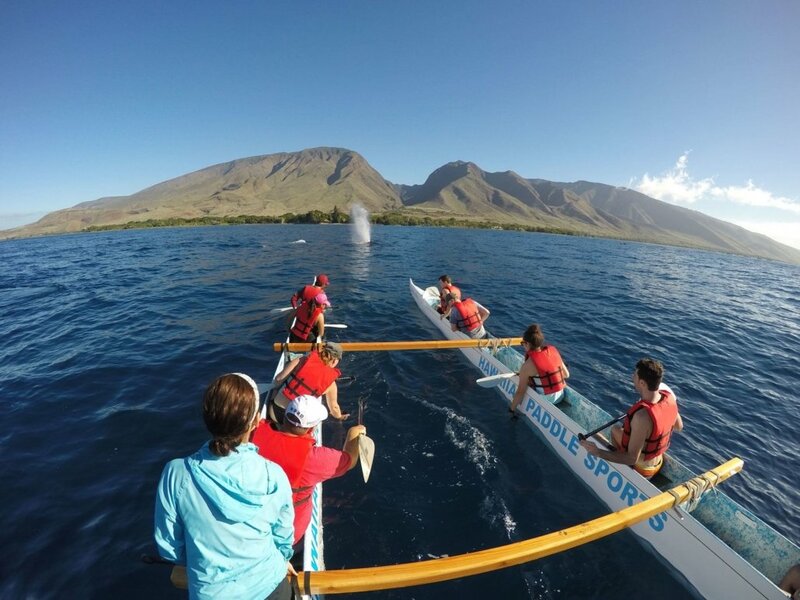 The stability, speed and higher vantage point from the Outrigger Canoe make this the ideal way to Whale Watch. Unlike our exclusively private Kayak Tour, SUP and Surf lessons, on our Hawaiian Outrigger Canoe tours we do combine parties to fill all the seats in the canoe. If time allows, we will jump in for a quick snorkel to view more marine life. Never did I think I would be able to see whales from the SUP board, but we had the perfect conditions to paddle out to where they were. My guide was awesome — she was great at putting me at ease, and gave me the instructions I needed to get paddling right away. What an incredible way to experience the whales — just you and the sound of their breathing, enough to take your own breath away. 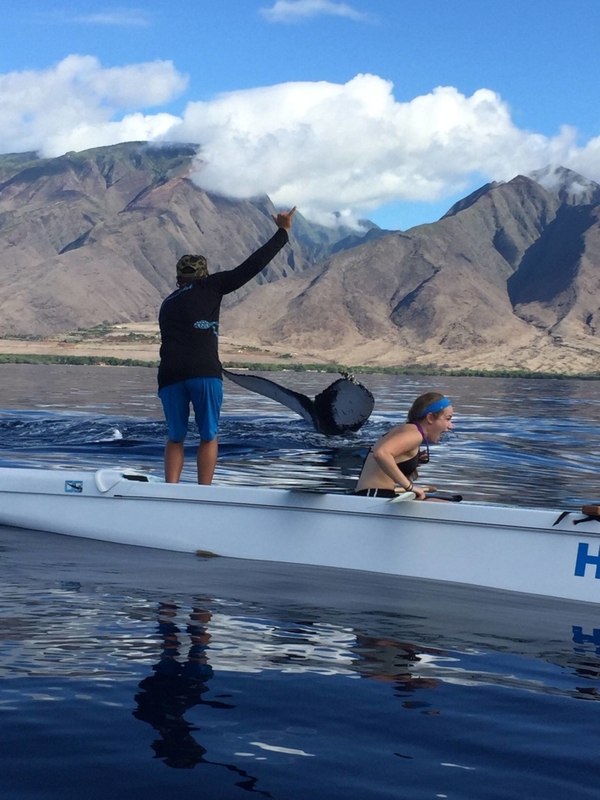 The guides at Hawaiian Paddle Sports not only give you a great lesson, but I learned so much about the whales and why they are so special to Maui. This was a highlight of my trip! Thank you HPS!! 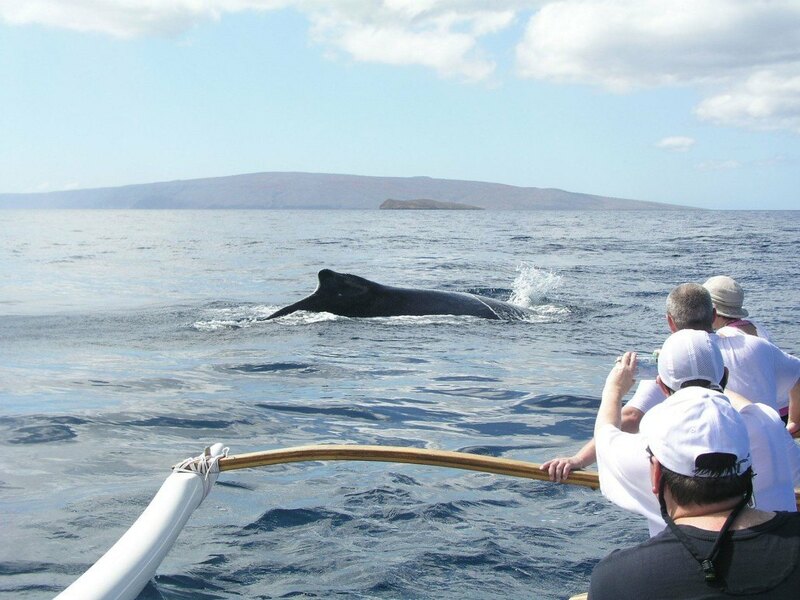 Every year between December and April visitors from all over the world flock to Maui to Whale Watch. 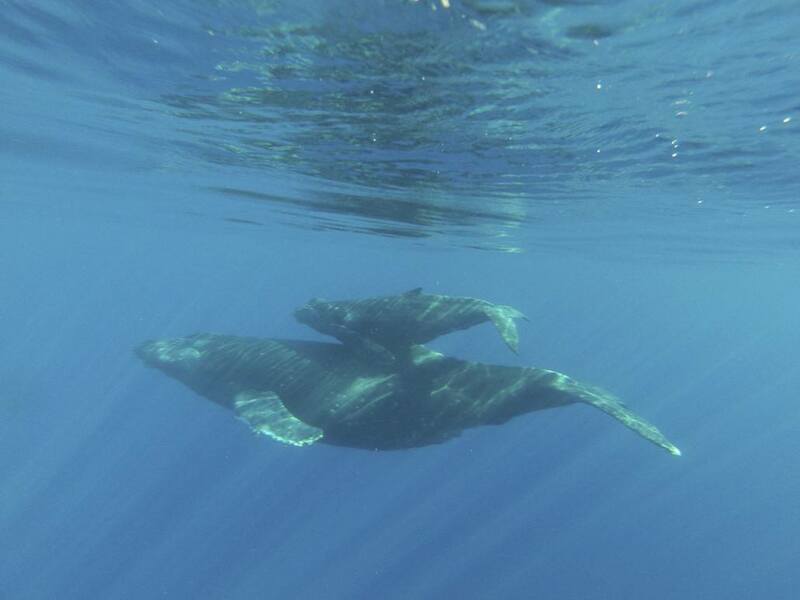 Maui’s shallow, warm and protected waters provide the perfect habitat for Humpback Whales to mate and give birth. 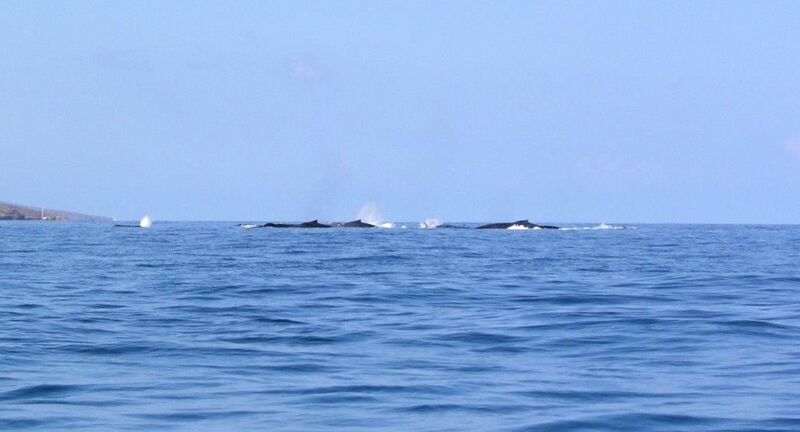 As a matter of fact the waters off of Maui’s South/West shores (Kihei, Lahaina, Wailea, Olowalu, Makena, Kaanapali, Kapalua, Napili) are the some of the most populated waters in the WORLD for Humpback Whales. Humpback whales are the most “watchable” whales due to their surface activities: Pec Slaps, Breaches, Fluke Slaps, Spy Hops and Tail Up Dives. They also surface on average every 10-15minutes to breath, spraying water 15 feet in the air as they clear their lungs through their blowhole, perfect for spectator’s or those on a Maui Whale Watching tour. 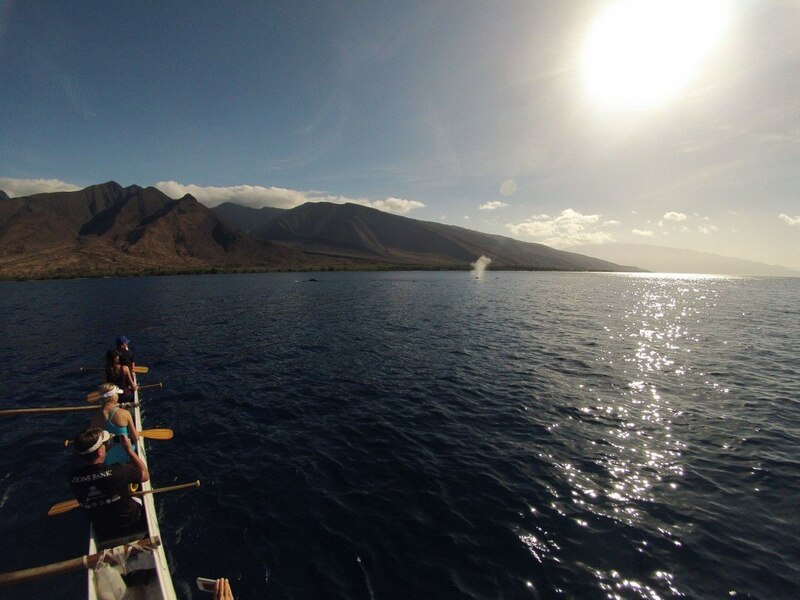 If you’re in Maui during whale season going on a whale watch tour is a must! 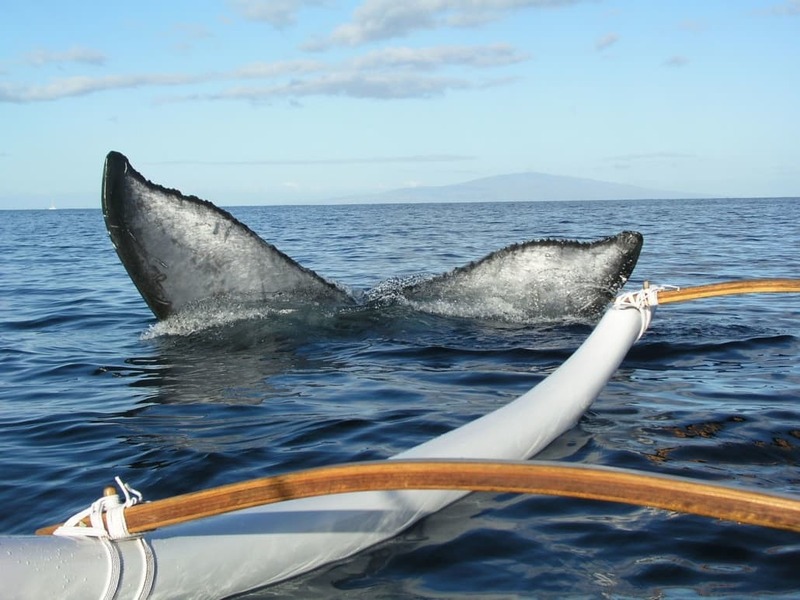 There are number of Large boat operators which offer Maui Whale Watching Tours. 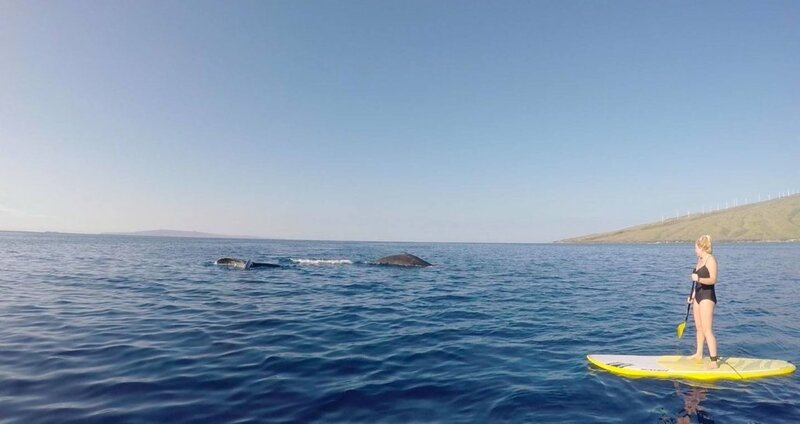 Our guests who have also been out on Whale Watching Boats say that there is no comparison to seeing a whale up close and personal on Stand Up Paddle Board, Ocean Kayak or Hawaiian Outrigger Canoe. No crowds, no engine noise, just peace and quite… then, “there she blows”!!! It is a very awakening experience to see the Humpback Whales in this way. 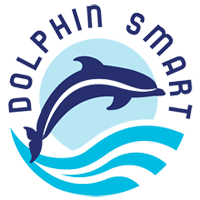 Why a PRIVATE whale watching tour? Most of our guest don’t need this question answered as you’ve found our website because you’re looking to get away from the crowds and off the beaten path. It has been our experience that guests come a variety of fitness levels, paddling ability and overall comfort in the ocean. On a group tour you are limited by the weakest paddlers in the group. No one likes to be held back and no likes to feel like they are holding others back. 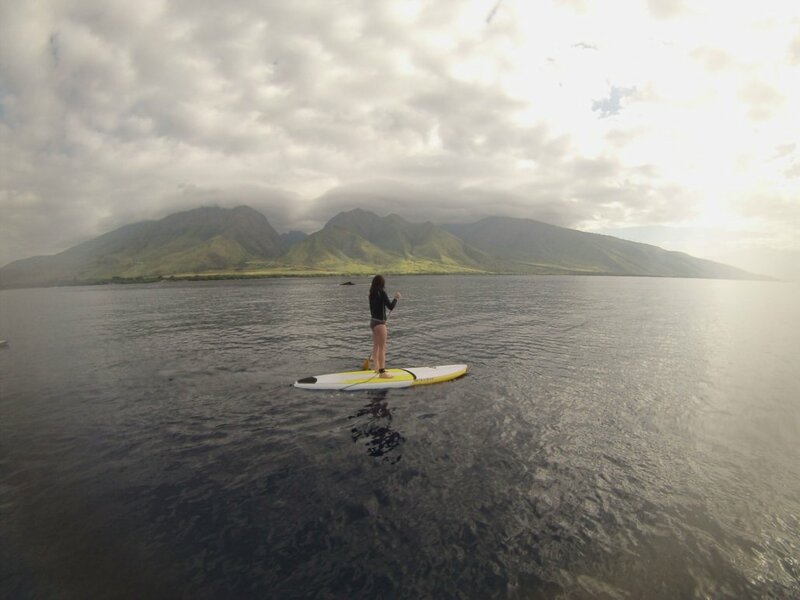 That is why Hawaiian Paddle Sports was created, to offer a private alternative to ocean activities on Maui. We feel that in Large whale watching group tours the guest experience is compromised at the expense of the whale watch tour companies profits. We’ll keep you away from the large crowds and offer a personalized, exclusive experience by the best guides in the business. That’s our promise to you. We’ll go at YOUR pace… its YOUR Whale Watch Tour! We’ll keep you away from the large crowds and offer a personalized, exclusive experience by the best guides in the business. That’s our promise to you. We’ll go at YOUR pace… its YOUR Whale Watch Tour! After a water safety and paddling orientation we begin a relaxed paddle off shore and begin looking for these gentle giants. We usually see several pods of whales on our tours with a wide array of activity: Pec Slaps, Fluke Slaps, Spy Hops, Breaches and you can even hear the whales singing!!! Your knowledgeable guide will share information about humpback whales, marine life and the islands surrounding you. 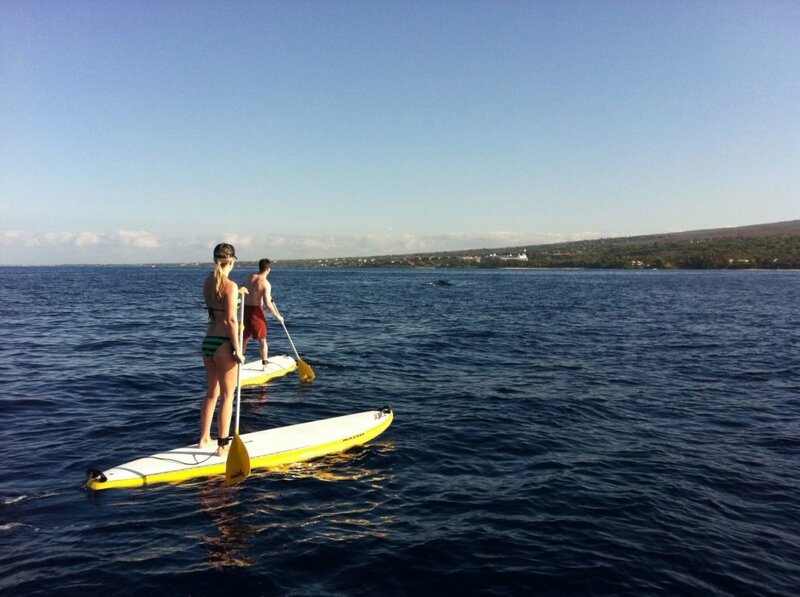 If time permits after the whale watching portion of the tour, we will leisurely paddle back to one of our favorite snorkeling reefs where you’ll cool off while snorkeling with Honu (Green Hawaiian Sea Turtles). 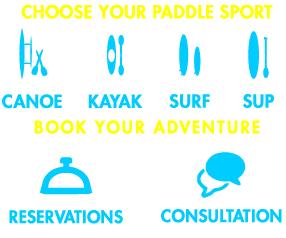 As with our other paddle snorkel tours, start by choosing your vessel: Ocean Kayak, Stand Up Paddle Board or Hawaiian Outrigger Canoe. 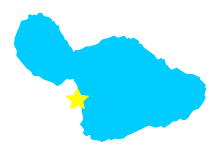 Then choose the location you wish to depart from: Olowalu or Makena. 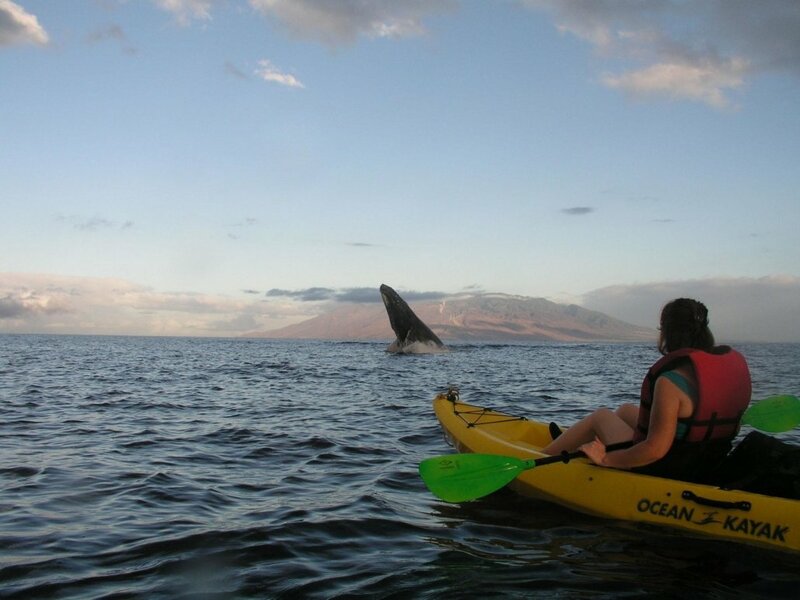 Come whale watching while on Maui. 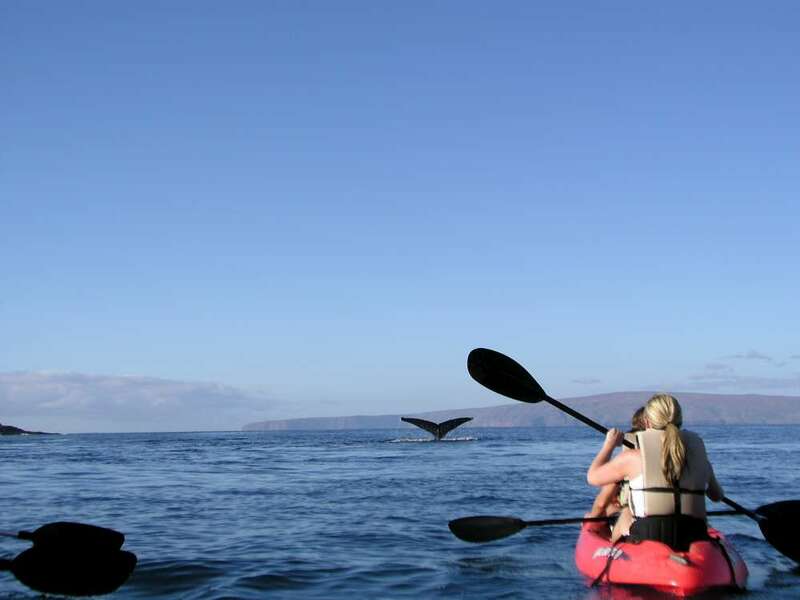 Take a kayak tour and see Maui’s humpback whales up close while kayaking. Mating and birthing are two of the most popular reasons for Humpback Whales to make the trek to Hawaii each year. The Auau Channel, between West Maui, Lana’i, and Moloka’i, is one of the most popular breedings and calving grounds. Males, follow prospective female mates and often find themselves in competition with other interested males. Humpback whales feed on a mixture of krill, plankton and other small fish and typically eat up to a ton of food per day. 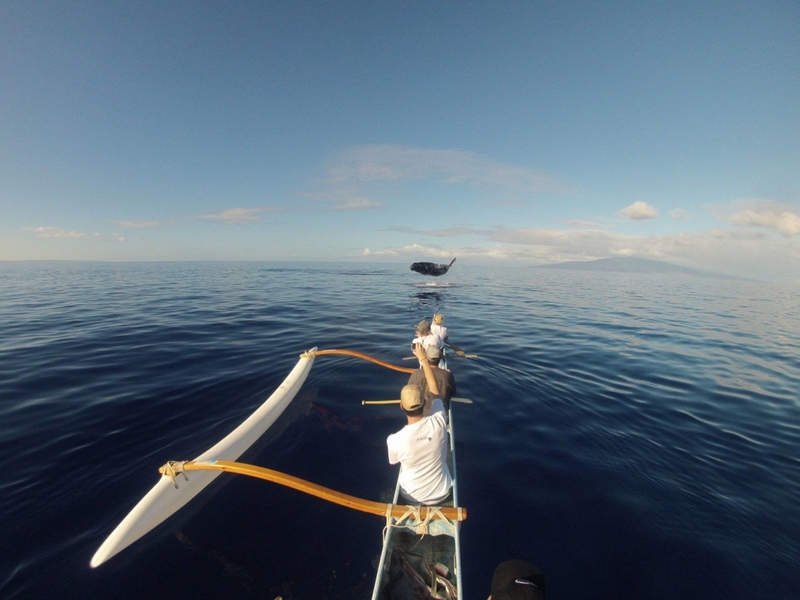 Since these types of fish aren’t found in Hawaiian waters, humpback whales do not eat while in Hawaii, surviving solely off their thick layer of blubber throughout the winter months until they return to Alaskan waters. Males are known to sing, and create complex songs that span an impressive 8 octaves and can be heard up to 12 miles away. The specific reason for these songs are not fully understood, it is believed they are done to attract potential mates and communicate with other whales. Humpback whales can hold their breath for up to 45 minutes and sleep by shutting off half of their brain at a time. They perform a number of interesting behaviors on the surface of the water, including slaps, lunges, peduncle throws, peduncle arches, fluke-up dives, fluke-down dives, spy hopping, lobtailing, blowing and, our personal favorite, breaching. The life expectancy of humpback whales is an estimated 45 to 50 years, although research has suggested that many can live upwards of 90 years. Although classified as an endangered species in the U.S. Endangered Species Act of 1973, it is estimated that only 30% of their original humpback whale population remains today, a total of 30,000 to 40,000 whales.